Trailer: Sir / It's Just Movies Trailer: "Sir"
I loved every minute of this delicate story of a young village woman who was widowed at 19. 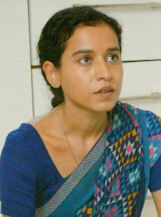 She leaves her husband’s family and becomes a servant in Mumbai with dreams to educate herself as a dress designer. Her employer is in despair as his dreams have been dashed. Through time his servant’s integrity, drive, and religious commitment impress him and he falls in love. The problem is that in India a widow belongs to her deceased husband’s family. Plus, there is rigid class segregation. Sensitively written and directed by Rohena Gera, “Sir” truly embodies the theme of the 2019 Portland International Film Festival (PIFF): Empathy has no ethnicity. Perfectly cast with lovable stars, “Sir” plays for the last time, as a part of PIFF’s encore performances, on Saturday, March 23.